The Bates College Orchestra, directed by Hiroya Miura, performs a program of music from the late 19th and early 20th centuries at 8 p.m. Saturday, Nov. 11, in the Olin Arts Center Concert Hall, 75 Russell St. Admission to the concert is free, but tickets are required. For more information, please call 207-786-6135. The program consists of Igor Stravinsky’s “L’histoire du soldat” (“The Soldier’s Tale”); Charles Ives’ “Unanswered Question”; Claude Debussy’s “Prélude à l’après-midi d’un faune” (“Prelude to the Afternoon of a Faun”); and Maurice Ravel’s “Ma mère l’oye” (“Mother Goose”). Miura says that he planned the orchestral program in part as a response to a concert taking place in 2007. The college’s orchestra and choir will collaborate on a major production of Johannes Brahms’ “German Requiem” during the winter, and so, in the interest of balance, “I thought of featuring French music for this concert,” Miura explains. The Debussy and the Ravel, he adds, “are quite challenging, as the instruments are very exposed in their transparent orchestration.” Both were written for ballet, and so a logical next step was the Stravinsky, another chamber orchestra piece intended as ballet music. “L’histoire” is scored for a mere seven instruments. The violinist soloist at Bates will be Robert Lehmann, a member of the University of Southern Maine music faculty, conductor of the Southern Maine Symphony Orchestra and the Portland Youth Symphony Orchestra, and music director of the North Shore Philharmonic in Beverly, Mass. Stravinsky’s “L’histoire du Soldat” is based on a Russian folk tale about a soldier who makes a deal with the devil. Stravinsky’s original piece included acting, speech and dance; he later adapted it as a half-hour concert suite. It’s spare but virtuosic, and fully in the modernist style. The “Unanswered Question,” one of Ives’ most frequently heard works, is a sort of existential query set for three distinct instrumental groupings. A phrase symbolizing the quest for life’s meaning is repeated several times by a solo trumpet, played in the Bates concert by Molly Dilworth, a first-year student from Yarmouth. A woodwind group attempts to answer, with increasing agitation and incoherence. But the real answer is carried by a string section that plays quietly throughout. The Debussy prelude, perhaps his best-known composition, is thought by many to mark the advent of musical modernism. Inspired by a poem by Stéphane Mallarmé, it’s marked by concentrated instrumental color, intricate motif writing and intense atmosphere. 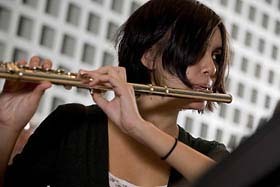 At Bates, the famous solo flute part will be performed by Sophia Budianto, a sophomore from Singapore. Ravel’s “Mother Goose” started life as music for four-handed piano, written for the children of friends. When a theater director pressed him for ballet music, the composer’s response was to recast the piano suite as orchestral music accompanying the story of Sleeping Beauty. Other well-known fairy tales, each with its own music, became the dreams of the sleeping princess. 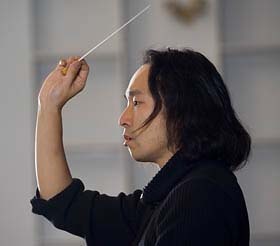 Hiroya Miura, a native of Sendai, Japan, has been active as a composer and conductor in Canada and the United States. In addition to conducting the orchestra, he teaches composition and music theory at Bates. During the winter semester, his courses will include a new entry on scoring film. Twenty-five of the orchestra’s 45 members are Bates students. Meghan Getz, a senior from Grand Rapids, Mich., is the concertmaster.